Allentown Public Theatre returned in January, 2017 with this moving production of the classic The Island, first performed in Allentown in April, 2016. The human spirit that conquered apartheid still lives. 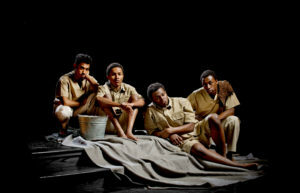 An award-winning play about two political prisoners in South Africa…whose story lives on in America’s prisons today. 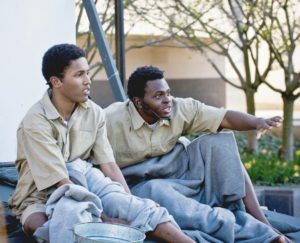 From left to right: Jamil Joseph and Ryan Fields (Robben Island inmates), and Chiedu Mbonu and Theophilus Timothy (modern American prisoners.) Photo by KeneK. 1973: Robben Island. The notorious prison that held Nelson Mandela is in full operation. Those who resist the racist policies of apartheid face hard labor and punishment at the hands of the guards. And in the very heart of this turmoil, John and Winston decide to put on a play. The Island tells the amazing story of two prisoners who find their voice in the Greek tragedy Antigone. Through drumming and dance, Allentown Public Theatre brings their legacy to present-day America – where racial tensions and corrupt prison systems are far from gone. The Island appeared as part of the IceHouse Tonight series, as well as the Lehigh Valley Voices of Conscience: Toward Racial Understanding arts series. We performed at the Arts Park, St. Luke’s Lutheran Church, and Christ Lutheran Church in Allentown April 22-May 1. 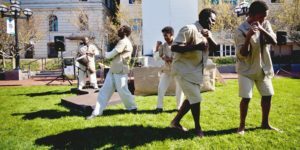 To the beat of Vernon Mobley’s drum, the chorus (Chiedu Mbonu and Theophilus Timothy, representing American prisoners, background) and Robben Island inmates (Jamil Joseph and Ryan Fields, foreground) mime hard labor in The Island. Click HERE to read The Morning Call’s preview of The Island. Click HERE to read Bethlehem Press’s preview of The Island. Click HERE for The Morning Call’s review of The Island. Click HERE for Bethlehem Press’s review of The Island. 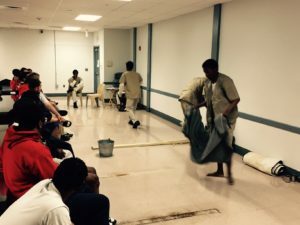 In April, APT was fortunate enough to be able to bring our production of The Island inside the walls of the Lehigh County Community Correction Center and perform for the inmates there. We performed at the IceHouse on January 13, 14 and 15. Tickets were pay-what-you-will. Click HERE to read the Morning Call’s preview article about The Island. Click HERE to read Lehigh Valley Stage’s interview with Director Anna Russell. Click HERE to read reviewer Susan Kalan’s blog post about the show. Coming soon: Lehigh Valley Arts Salon’s podcast of their January 9th interview with Director Anna Russell, Island Chorus member Theophilus Timothy, and APT Ensemble member Willow Reichard-Flynn!